Summer weather brings many risks for workers. In addition to concerns about heat, summer thunderstorms could also potentially result in workers facing the risk of a lightning strike. To draw attention to the dangers of lightening, the National Weather Service holds Lightning Safety Awareness Week. This year, Lightning Safety Awareness Week ran from June 22 through June 28, 2014. Employers and workers both need to be aware of the dangers that lightning can prevent and take steps to avoid exposure to dangerous weather. A worker who is hurt on-the-job by a lightning storm should consult with an experienced workplace injury attorney for help pursuing a claim for compensation. In 2014, there have already been seven deaths caused by lightning strikes. These deaths occurred when picking blueberries, fishing, closing car windows, doing roofing work and traveling on a highway. From 2006 to 2013, there were a total of 261 lightning-related fatalities that occurred, with males making up 81 percent of the victims. June, July and August were the peak months for lightning deaths and more than 70 percent of the fatalities occurring during these three months. Ranching and farming was the industry with the most lightning related fatalities, as 14 workers died doing these jobs when they were struck during a storm. Remember that there is no place outdoors that is safe during a thunder and lightning storm. If you can hear thunder, this means that lightning is close enough to strike. As soon as you hear it thunder, you should move to a safe shelter such as a metal-topped enclosed vehicle with the windows up or a building that has electricity or plumbing. You should stay in the safe shelter until at least 30 minutes pass from the last time that thunder can be heart. When indoors during a lightning storm, stay off of electrical equipment that could put you in direct contact with electricity such as computers and corded phones. Sinks, baths and faucets should be voided and you should not lean on concrete floors or walls nor go too close to windows. Those who are forced to be outdoors during a lightning storm should immediately get off of high ground including mountain ranges, hills or peaks. Avoid lying flat down on the ground and do not seek shelter under an isolated tree. Stay away from bodies of water including ponds and lakes and avoid objects like barbed wire fences or power lines that conduct electricity. 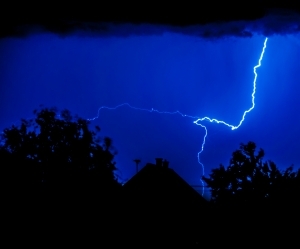 By following these tips, workers can hopefully avoid being struck by lightning on-the-job. Employers should ensure that those who work outdoors are not put at risk by being asked to do dangerous tasks during a lightning storm. Advice to Entrepreneurs on Worker Safety, June 15, 2014.